Formed by Masami Takei & Shotaro Yamazaki in Mar 2010. 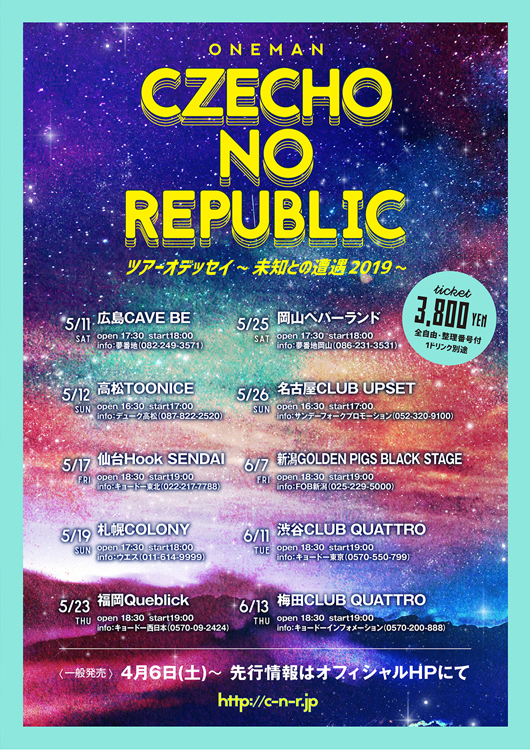 They named "Czecho No Republic" because they liked the sound "Czecho". There is no political cause and means. Actually we would not keep going this band at first because we formed the band instead of predecessor band stopped. 2010 / Adim Yoshida joined as the guitarist & synthesizer player. 2011 / Yagi joined as the guitarist. We released 1st songs "erectionary" from Japanese independent label "muffin discs" to only Tower Records. 2012 / The guitarist Adim Yoshida left for becoming a full-time designer. 2013 / Mai Takahashi joined as the vocalist, synthesizer player & guitarist. Also Kazuki Sunagawa joined as the guitarist. We debuted as 5 members major rock band from Nippon Columbia in Jan. Also we released 1st major album "NEVERLAND" in Oct. One of the song MUSIC in the album was adopted the ending song of the "No Continue Kid ~ Bokura no Game Shi ~" by TV Tokyo in Oct.
2014 / We worked as the personality on the radio "All Night Nippon [ZERO]" for a year from Apr. We released 2nd album "MANTLE" & debuted at the 17th of Oricon ranking in July. We released 1st major single "Oh Yeah!!!!!!!". The song was adopted the Japanese Anime "Dragon Ball Kai" as the ending song by Fuji TV. 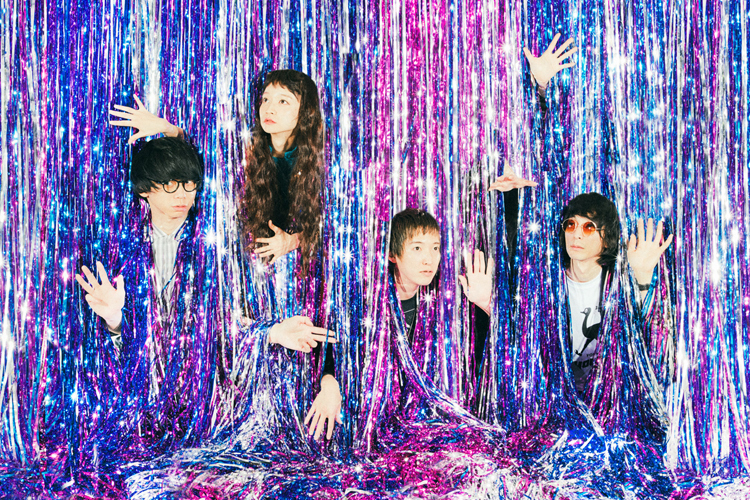 2015 / The collaboration TV CM "Pocky×Czecho No Republic" was broadcasted on the Space Shower TV & Glico screen vision of Shibuya scramble Intersection from new year's day for 3 months in Jan. Also we released 3rd major album "Santa Fe" in Sep. One of the song "Firework" was adopted the "SICKS ~Minna ga Minna, Nanikano Byoki" as the theme song by TV Tokyo. 2016 / The song "Forever Dreaming" was adopted the Japanese Anime "Dragon Ball Super" as new ending song by Fuji TV in Apr. We appeared "THE KOXX PRESENTS《PiXEL Vol.3》" at Lottecard Art Center Art Hall in Seoul, Korea in Sep. Also We released 4th major Album "DREAMS". 2017 / We appeared "NO FEAR FESTIVAL" in Taichung, Taiwan in Aug. Also we released a co-right single "Time Traveling" produced by SKY-HI as Czecho No Republic×SKY-HI in Sep.
2018 / We released 5th album "Preparation for Travel" in Mar. Also we toured in Japan and played at the Wall in Taipei, Taiwan as solo-show. Yagi left in Apr. Takei tried first time in Sep to translate the Czech Republic's picture book "O PEJSKOVI A KOCICCE JAK SI DELALI DORT" written by Josef Capek. We released a song "Baby Baby Baby Baby" as exclusive distribution service for ZIMA "More Summer Campaign". Also we appeared the web CM. © 2018 Czecho No Republic. All Rights Reserved.